Walk through the process of creating an account, buying a subscription, setting up the apps, and customizing the Companion profile. 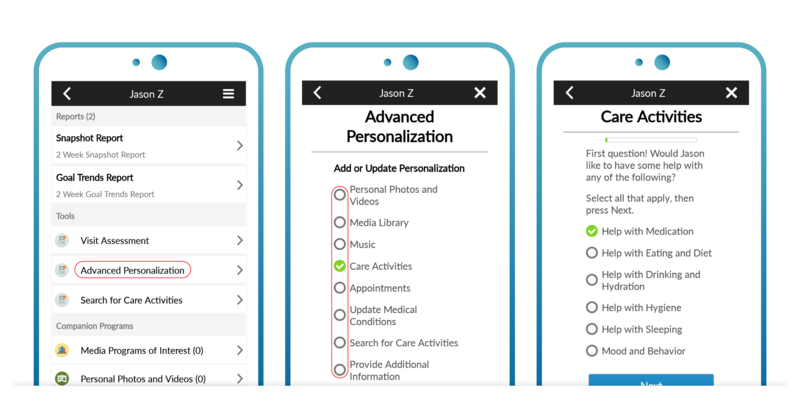 Let’s step through the process of creating your Family Connect account, buying a Care 360 subscription, setting up the Companion profile, and activating the Companion. 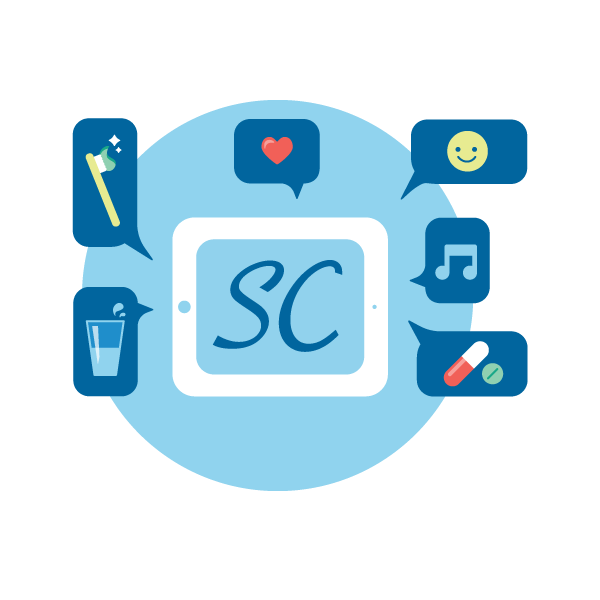 You will create and manage Care 360 subscriptions with this Family Connect account. It will also be the login to your Family Connect App! 2. 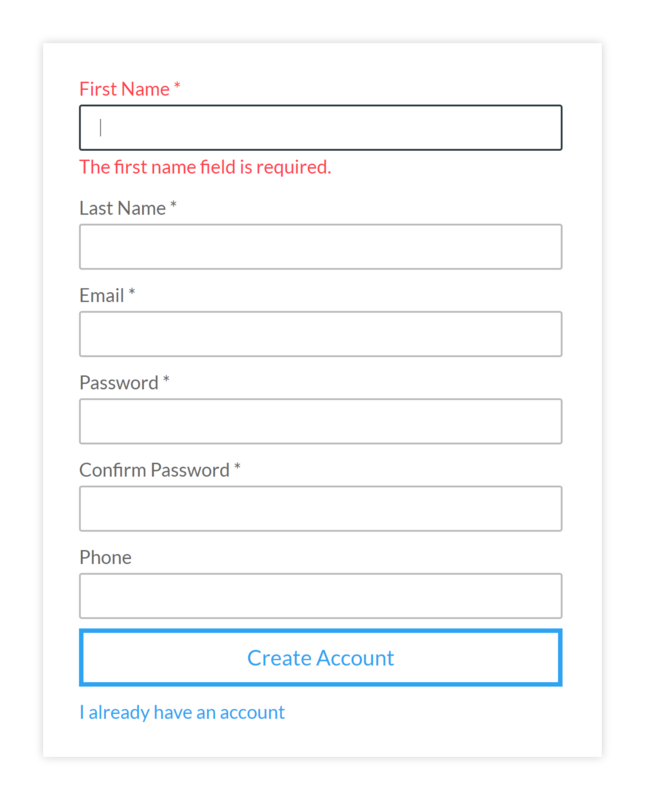 On the Login page, click the “Create an Account” button. 4. Now login with your new Family Connect account information. Now you are ready to Buy a Care 360 subscription! 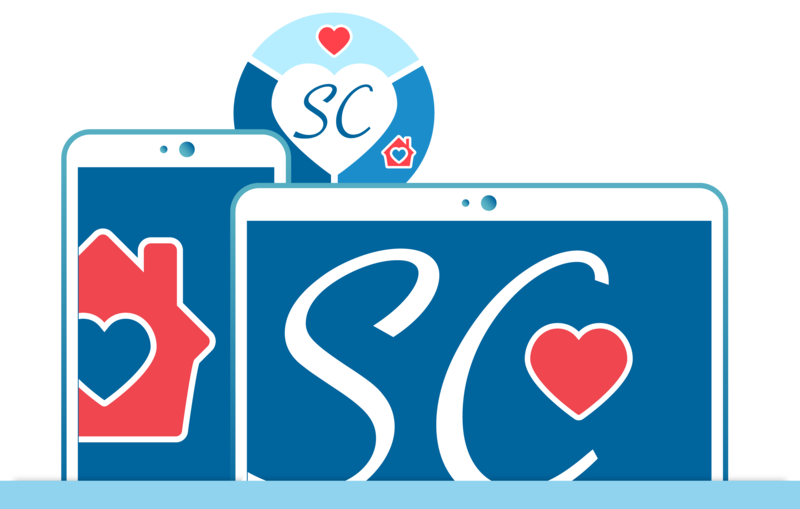 The Care 360 subscription includes a Companion profile and unlimited Family Connect contributors for that profile. The Companion profile will be used by either yourself or someone you care for. 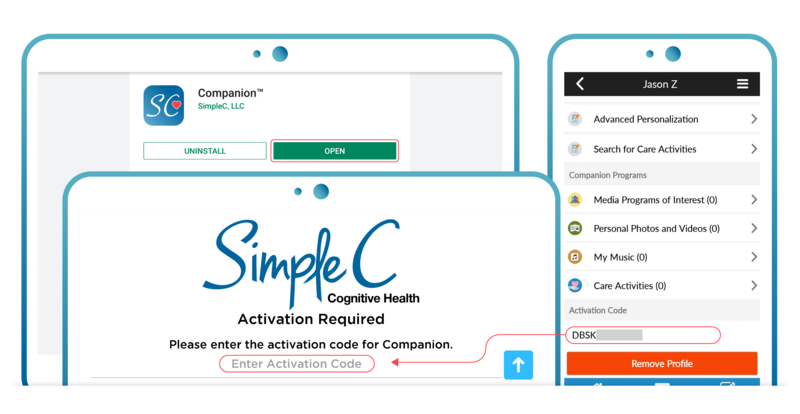 Our digital therapeutics is delivered through the Companion, an app installed on a tablet, to help the user overcome cognitive, behavioral, or chronic health conditions. 2. 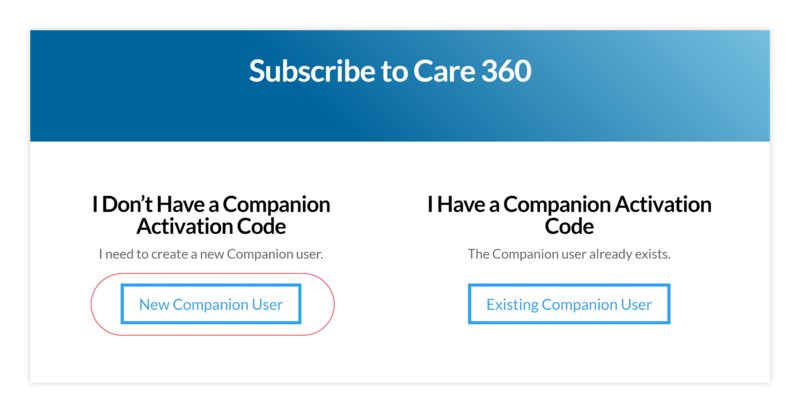 Click “New Companion User” to buy a new Care 360 subscription. 3. 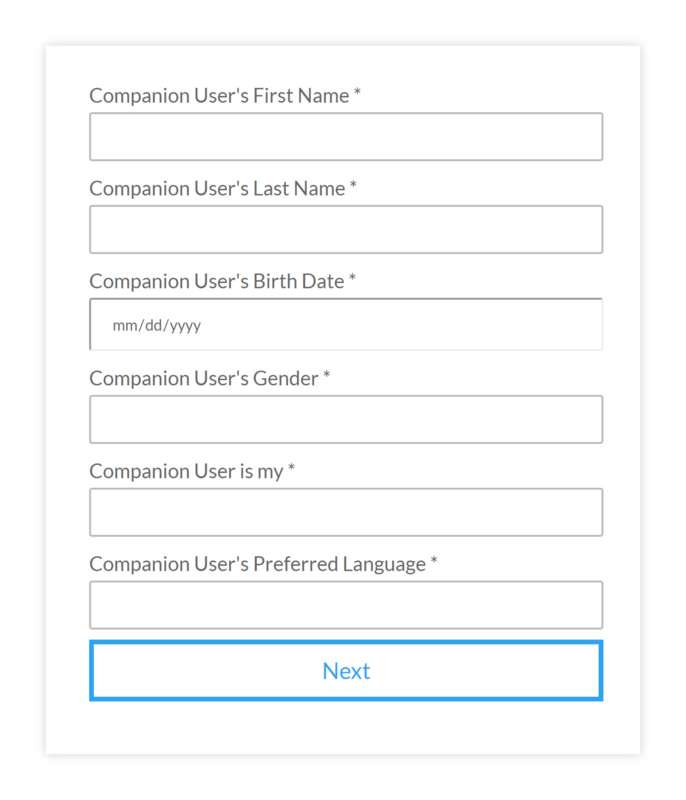 Fill in the information for the Companion User. Click “Next” when done. 5. Enter your debit or credit card information to pay, then click “Make Payment.” Your receipt will be emailed to you. Done! Now, you will be taken to your “My Account” page where you can see and manage your Care 360 subscriptions. Now you’ve created your Family Connect account and bought a Care 360 subscription. Next you need to set up your Family Connect and Companion Apps. 1. On your phone, go to the Play Store (Android) or App Store (Apple) and type “SimpleC” in the search bar. 3. 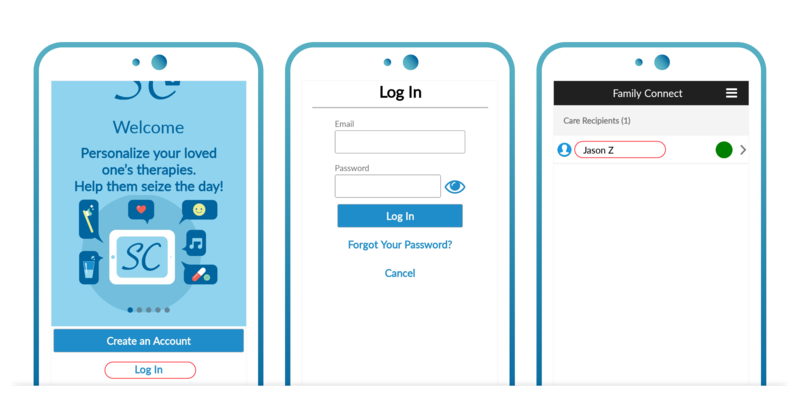 Once Installed, open the Family Connect app and login with your Family Connect account information. This is the same username and password you used when you created your Family Connect account in Part 1. 4. Once logged in, you should see your new Companion user listed under the “Care Recipients” section, select it. Now you’re in your Companion user’s dashboard! 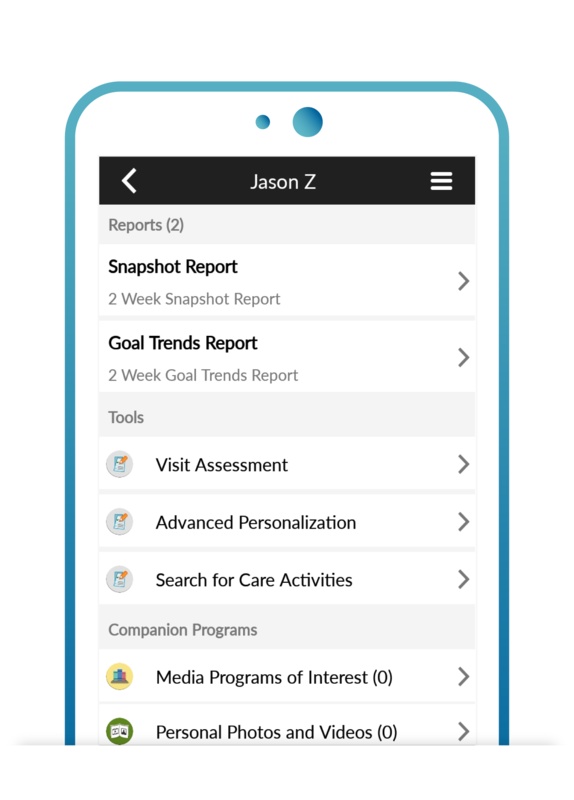 The dashboard is where all the therapy creation, customization, and reporting happens. The next step is to use the dashboard to set up and customize the Companion profile. Your Companion user’s profile is empty. We need to add their challenges, symptoms, preferences, hobbies, and interests using the “Advanced Personalization” tool on the dashboard. 1. In your Companion user’s dashboard, click “Advanced Personalization” in the tools section. 2. Categories and questions will show up. Choose a category and answer the questions based on the Companion user’s preferences. Repeat this process for each category. We recommend that you complete some categories more than once to add more personalization, especially for care activities and personal photos. This step is extremely important. The more personalized the Companion is, the more meaningful and effective the digital therapies will be. Now that your Companion user’s profile has been customized, it’s ready to be set up! First, we need to download the app onto an Android or Apple tablet. You can also use a smartphone, but a tablet is recommended for viewing the therapies. 1. 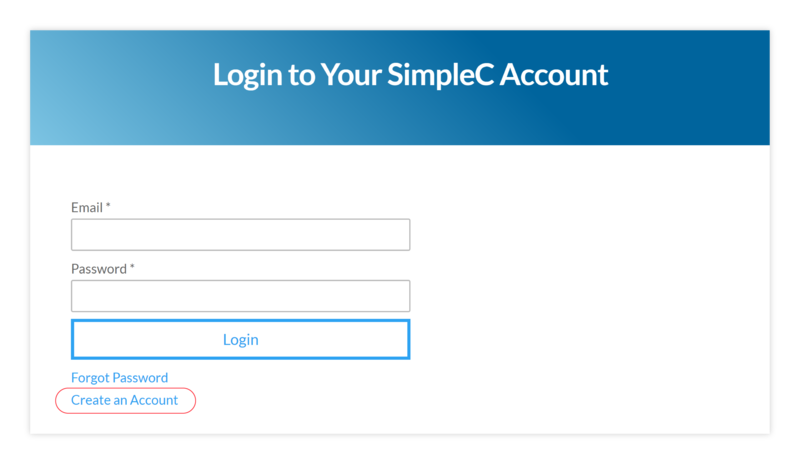 On a tablet, go to the Play Store (Android) or App Store (Apple) and type “SimpleC” in the search bar. With the SimpleC Companion app downloaded, we need to grab the activation code from Family Connect and log into the Companion with that code. 1. Once Installed, open the Companion app. The Companion will ask you for an activation code. 2. 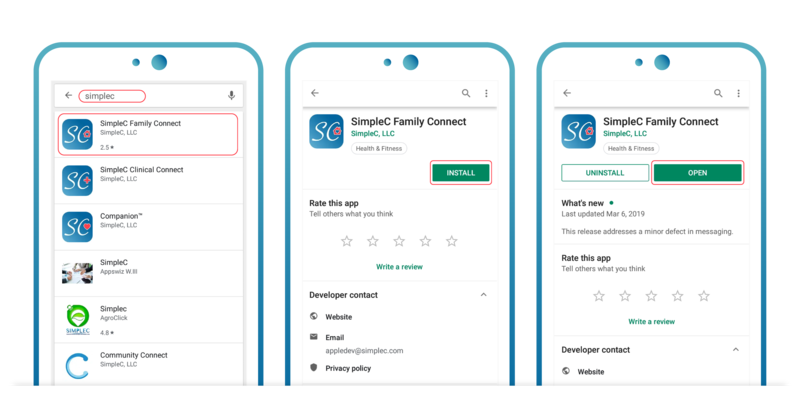 On your phone, go to your Family Connect app, select your Companion user’s profile, and scroll to the bottom of their dashboard. You should see the activation code. Type it into the Companion. The Companion is now set up! Done setting up, what do I do now? The Companion provides therapies and reminders to the user, but it’s only helpful if it’s visible and accessible. If the Companion user doesn’t carry the tablet around with them, make sure it is propped up in a central most-visited part of their house. This will ensure that the therapies are seen as often as possible. Your next step is to schedule the new therapies to play automatically throughout the day based on the user’s personal routines. So far, you’ve added relevant therapies to your Companion user’s profile. Now you can customize each therapy to fit the Companion user’s personality. Add their favorite upbeat music to their “Wake Up” therapy. Record your Trusted Voice™ message to say “Good morning dad, I love you!” Rename the therapy titles and captions in a way that the Companion user responds to. You know the Companion user better than anyone else. If you can’t find a therapy to fit the Companion user’s needs, make one from scratch! Congrats! You’ve finished the walkthrough!